This year, I have decided to start a new idea. A new way of giving that is hands on, direct, and has the highest level of positive impact on the recipient. The White Phoenix of Autism Acceptance. Those of you who have followed my story are aware of the significance of the Phoenix, the mythological bird, has to me. For others, I believe the Phoenix is seen as a glorious bird that is consumed by it’s own flames, but rises again anew. This fire versus rebirth and growth is a familiar theme to people with autism. We understand the fire of autism when it restricts us from engaging in various areas of life, but we also understand the burn of desire, accomplishment, and growth. To me, the Phoenix is a far better symbol of autism than the lonely puzzle piece. The significance of the color white came from the thought that all new ideas begin with a blank sheet of paper, which is usually a white sheet. Though white has many cultural meanings varying from innocence to death, the color white in this instance is meant to signify the beginning of something new. So, what is the White Phoenix of Autism Acceptance? The giver begins by deciding what kind of gift they wish to give and to whom they want to give the gift. The giver can think of a gift of any scale, but it must be a gift the giver can give immediately, without delay or caveats. Then, the giver selects a person or family with autism they wish to give the gift to. This gift doesn’t go to an organization, but directly into the hands of the person or family with autism. Next, the giver gets a square sheet of white paper, and then visits one of the online videos below (bottom of this post) to make their origami Phoenix. When finished, the giver writes what the gift is on the tail of the White Phoenix. The giver can photograph their Phoenix and post it on social media with the tag #WhitePhoenixAutism. When the giver hands the origami White Phoenix to the recipient, the giver must be ready to fulfill the promise immediately. The giver expects nothing in return, giving freely, and the giver must not give a promise of help sometime in the future. Making the origami may be challenging, and it won’t look perfect. 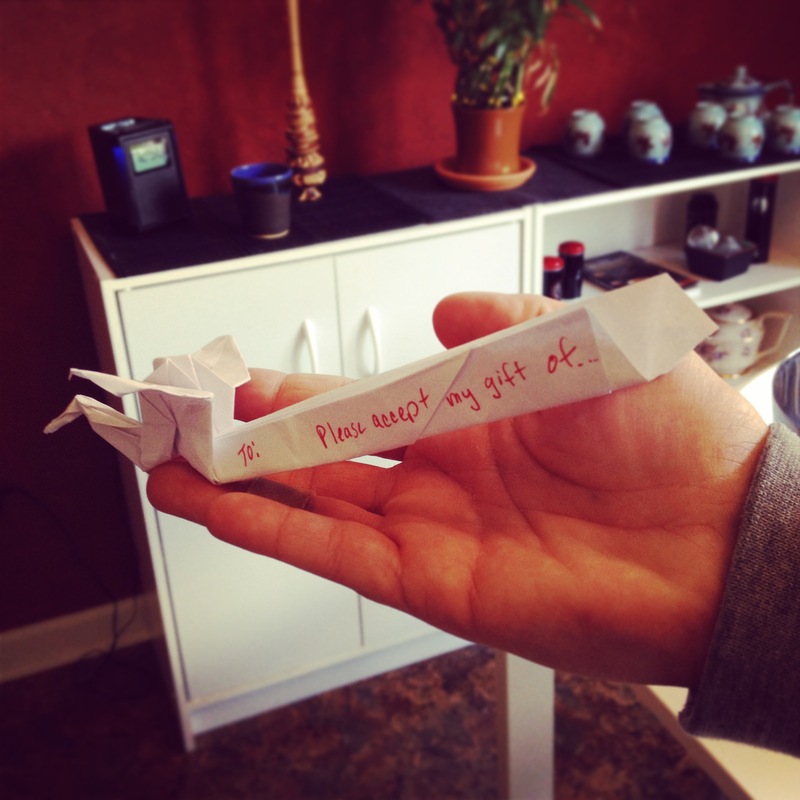 However, partaking in the steps necessary to make the origami means you have thought about your gift. Get creative! Have the family over to help make it, or make it a school or office activity. It is deeply satisfying when you finish. What are the rules? I just hand people stuff? You are not just handing people stuff. You, as the Giver, are in complete control of what you are giving and to whom you are giving the gift. You decide the size, and with your up-close knowledge of the recipient, you can give them something they really need. This type of giving is very social, very personal, and certainly doesn’t have the simplicity of donating a few dollars online, but there are already plenty of organizations out there that accept cash giving. 1) Giver must give what they write on the tail of the White Phoenix with no restrictions, caveats, rules, or expectations in return. 2) The gift MUST be deliverable immediately. The Giver must not give an IOU or a promise of help in the future. The Giver must not promise something they rely on others for unless they have already cleared it with the others to deliver the gift immediately. So, no matter if you give a package of socks or offer to pay off the recipients mortgage, you must show up with the package of socks in hand, or the check to pay the mortgage in hand. Don’t say “my company will pay off your house” and then find out after the fact the company won’t approve the gift. 3) The giver must put the White Phoenix directly in the hands of the autistic recipient. This is person to person giving. Do not give to an organization that promises to help, no matter how great you think they are. Does this mean you have to visit the the person’s home or place of business? No. If you want anonymity, you can mail it, or have it delivered by a gift buddy (a person giving on your behalf). Be creative, just remember the gift must be immediate. 4) You cannot make the autistic recipient retrieve the gift. Do not send a White Phoenix with instructions to retrieve a gift. Remember, it is immediate. The only exceptions would be if you are sending a gift card, prepaid gift certificate, or other such gift that can only be consumed at the place where the gift is issued. Just be prepared to offer transportation to autistic individuals who cannot drive. Be nice. Don’t give tickets to Disney World in Florida to an autistic individual in Kansas who cannot afford to travel to Florida. 5) The gift can be any size. It can be money, an item, a vacation, a dinner, furniture, a house, a car, or even a day on the town. It just must be real and something to improve the life of that individual. Entertainment gifts are wonderful as many people on the autism spectrum are denied participation in fun events because funds are widely used for food, shelter, and health care. 6) The recipient must be an individual with autism or a family member of an autistic individual who is the primary caretaker of the autistic individual. If you wish to give to a group, it must be a small organization that uses whatever you give immediately and applies ALL of your gift to the people with autism that organization helps. So, for example, you know of an autistic group home and want to give there? The gift you give must go directly yo the hands of the people with autism with ZERO percent used in administrative, overhead, or salary costs. This is hand to hand giving, where 100% of your gift goes to an individual with autism. What do you, Laura, hope to accomplish? I hope to re-ignite people’s passion for giving and combine it with their passion for social engagement. I hope to directly impact people with autism in a positive way without the hours of paperwork, and unrealistic expectations. I hope to direct more dollars to improve the everyday life of people with autism and away from organizations that eat up the donations in large salaries and overhead. I hope to see people with autism get gifts that allow them to not just live life, but enjoy life. Are there tax breaks? Probably not. Is it time consuming? It may be. Will it change lives? Definitely. Give today, and if you please, post on social media with the tag #WhitePhoenixAutism.